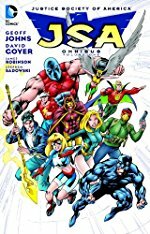 I have Johns' JSA run collected in trade paperbacks. It's been a while since I read through them -- maybe I'll refresh my memory on the weekend and come back to share some thoughts. I enjoyed this run in single issues as it came out but never felt the desire to return to it. What I remember most was feeling like this was a poor venue for that Starman and enjoying Stargirl and Mr Terrific. I jumped off this omnibus half way. I enjoyed the aesthetic a lot and some of the characters / one-liners, but the whole thing just felt like it was for people who already know the stories and just want more; I didn't feel hooked in or even really up to date about what the heck was going on.